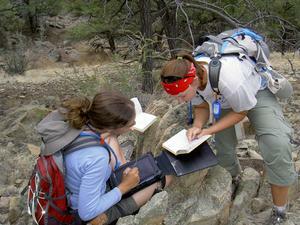 Integrating Research and Education > Teaching with GeoPads > What is the Purpose of this Site? In developing this website, we have aggregated tutorials, examples, and practical advice based on the experience of numerous colleagues and programs who are the innovators and early adopters in using digital technologies in field instruction. Our goal is to minimize the technical, pedagogical, and practical barriers that make it difficult for novice users to efficiently and effectively use this technology in field instruction. This website will provide the essential information you'll need to design and implement your own field activities using GeoPads. We invite you to freely use the information presented on these pages, and to contribute your own instructional activities to these collections in the future. GeoPads provide a fundamentally new way to engage students with learning in the field. By bringing information technologies into the field, it is now possible to integrate many types of data such as digital elevation maps, air photo and satellite imagery, a variety of geophysical and geochemical databases (e.g. chemical anomaly maps, aeromagnetics, gravity) to help students develop problem-solving strategies in the field. The use of these types of information systems in the field will soon be the professional standard in research and in industry.